"This is a policy we don't support." On Friday afternoon, Donald Trump signed an executive order indefinitely banning Syrian refugees from entering the United States and blocked citizens of Muslim-majority countries Iran, Iraq, Libya, Somalia, Sudan, Syria and Yemen from entering for 90 days. The inexplicably immoral order led to chaos at airports across the country, as students, visitors, refugees and even green-card-holding residents were detained for several hours. Thankfully, several federal judges ruled against Trump's order Saturday night, resulting in the release of detainees ... for now. 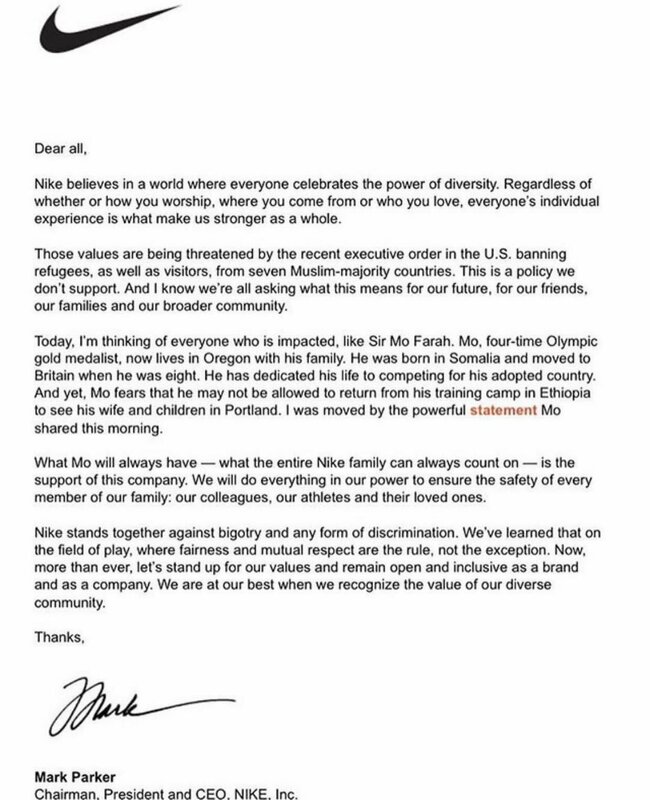 Often in front of political and human issues, Nike CEO Mark Parker has issued an official statement condemning Trump's Muslim ban, saying that, "Nike believes in a world where everyone celebrates the power of diversity." Parker also referenced a statement made by distance runner Mo Farah, who was born in Somalia, moved to Britain as a child and currently calls Portland home with his wife and children. "Nike stands together against bigotry and any form of discrimination," said Parker. "We are at our best when we recognize the value of our diverse community." Read Parker's full statement below.